Cairt shawin the distribution o Niger–Congo leids. Broun is the Bantu subfaimily. 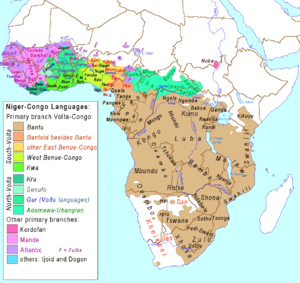 The Niger–Congo laeids constitute ane o the world's major leid faimilies, an Africae's lairgest in terms o geografical aurie, nummer o speakers, an nummer o distinct leids. This page wis last eeditit on 7 Februar 2016, at 18:47.